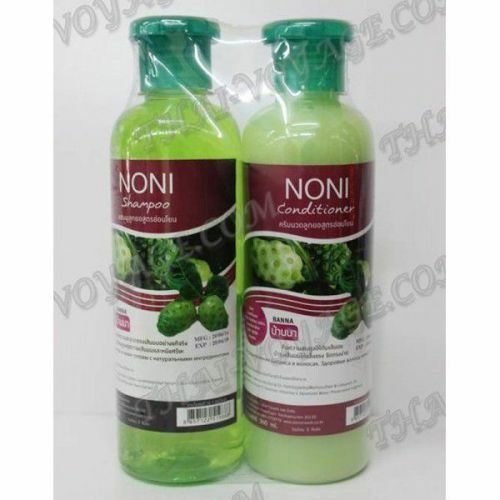 Shampoo and hair balm with an extract of noni are safe to use, as produced only from natural Chinese herbs and extracts of noni. Gentle skin care scalp and hair roots making strong and shiny hair, thick, light and docile. It reduces dandruff, itching and hair loss immediately after the first application. It stimulates blood circulation and hair growth. It prevents the appearance of gray hair. Shampoo and balsam contain no chemicals! Suitable for all hair types. Application: Apply shampoo to wet hair, massage for 2-3 minutes from the roots to the tips, then rinse with water. After washing the hair shampoo, balm to the hair, spread over the entire length of hair. Gently massage, then rinse.